When’s the last time you’ve seen a minivan with contingency/sponsor stickers? 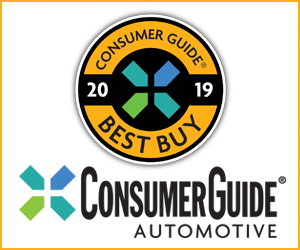 Counteracting the staid family-hauler image that modern minivans seem to be saddled with was certainly part of the agenda as well—Toyota is looking to show off that the Sienna can be a fun-to-drive vehicle and not just a lifeless mom-mobile. And, since the entire One Lap event takes place in eight consecutive days, it’s also a trial-by-fire team-building exercise in problem solving on the fly… and sleep deprivation. 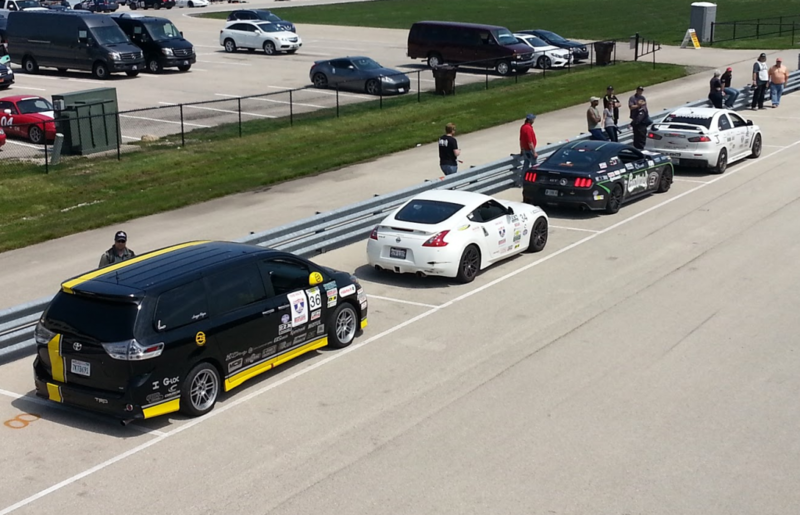 We caught up with the Toyota team during the One Lap tour’s stop at the Autobahn Country Club in Joliet, Illinois. I took the Sienna SE+ for a quick couple of laps around the Autobahn’s south course, and, well, it’s the best minivan I’ve ever driven on a racetrack… for whatever that’s worth. One I got past the incongruity of the high seating position and the fact that I was wearing a helmet in a minivan, I was pleasantly surprised at how competent a 4600-plus-pound grocery getter could feel when being hustled through fast corners. 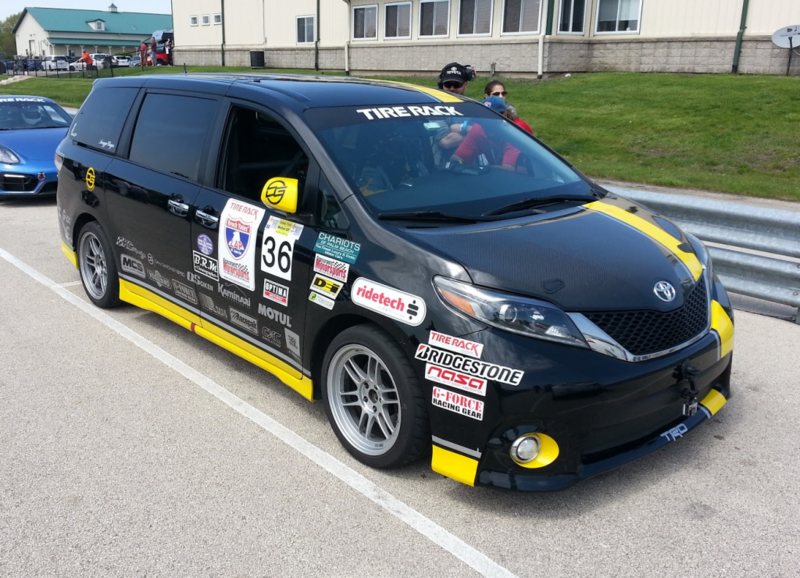 Pirelli P Zero summer performance tires and upgraded brakes go a long way toward increasing the Sienna’s athleticism. 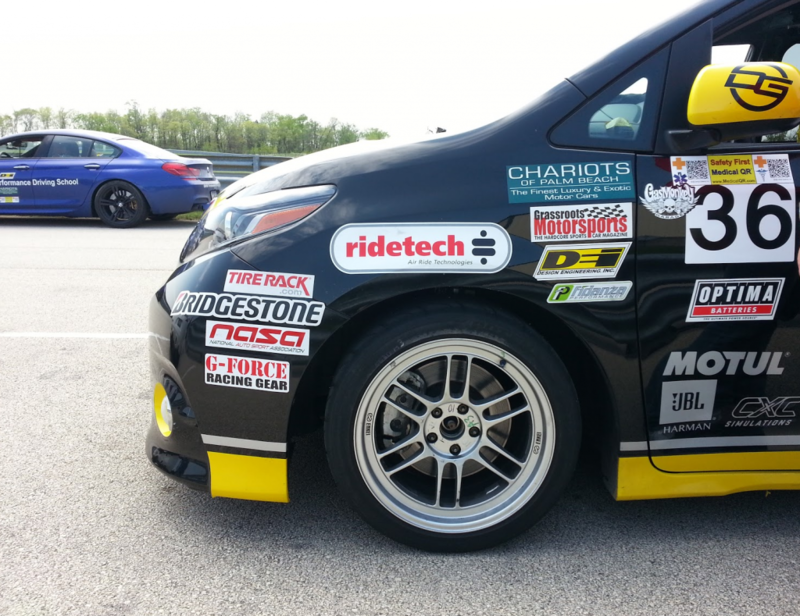 The Sienna R-Tuned ended up finishing 21st overall at the Autobahn out of 69 entries, a more than respectable showing considering the full field included Corvettes, a new Ford Mustang, a Mitsubishi Evolution, and a Dodge Viper. Pretty cool for a minivan, right? The Sienna R-Tuned wears 18-inch Enkei RPF1 wheels on Bridgestone Potenza rubber, a Kaminari carbon-fiber hood with AeroCatch hood pins, and sweet yellow stripes. The suspension has been revamped with adjustable shocks, racing springs, and a custom rear ride-height adjustment system. Sienna R-Tuned driver (and Grand Am Rolex GT champion) Craig Stanton gets some pre-race instructions before taking the R-Tuned out on the track. Both of the One Lap Siennas run mostly stock engines and 6-speed-automatic transmissions. 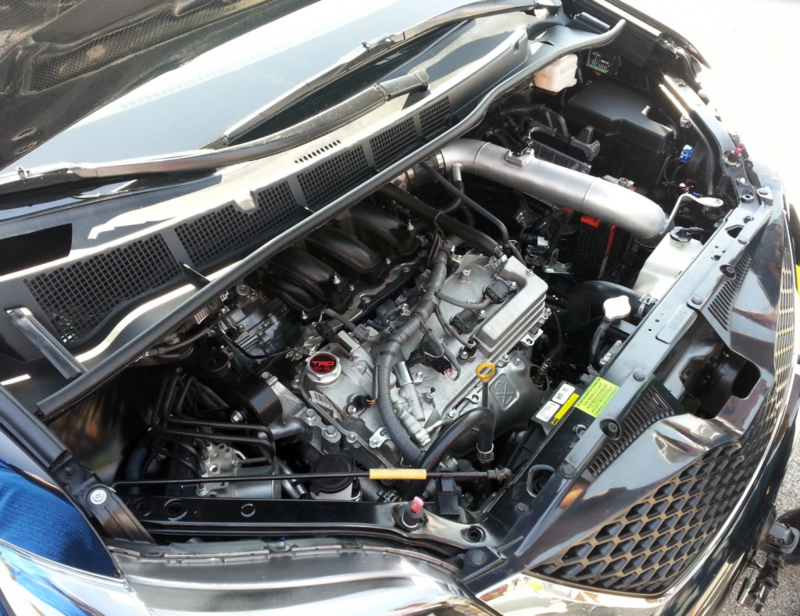 The R-Tuned’s engine-compartment modifications include TRD oil-filler and radiator caps, a DG-Spec cold-air intake, and an Odyssey lightweight battery. 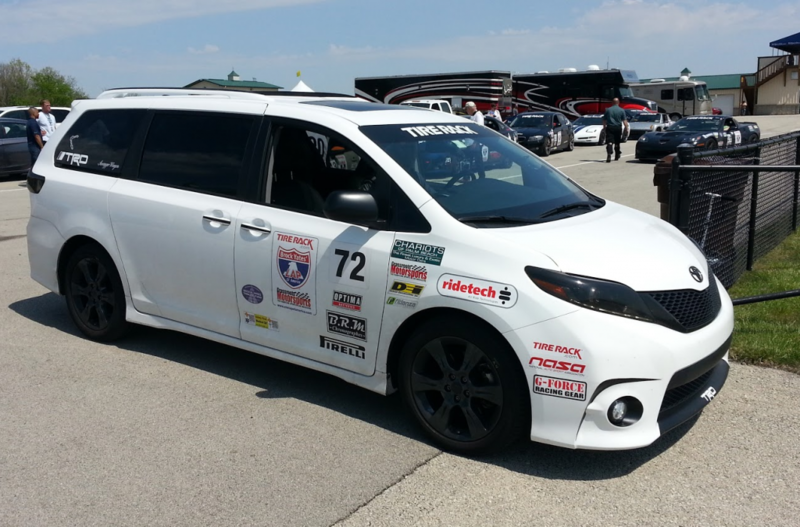 It’s obvious that the Sienna R-Tuned’s interior has been gutted and fortified for racing, but it’s also clear that this is no radical, tube-framed race machine that only looks like a minivan. 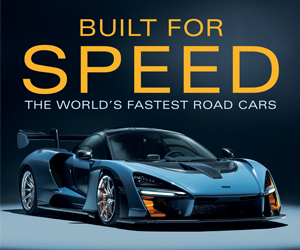 These modifications are well within the parameters of true production-vehicle racing. 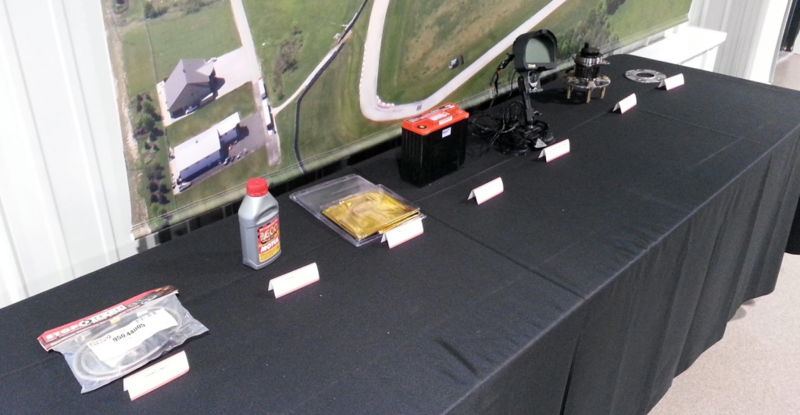 The items displayed here represent some of the hardware it took to turn the Sienna into a track-capable machine: StopTech stainless-steel brake lines, racing-spec brake fluid, heat-barrier gold foil, a lightweight Odyssey battery, Racepak data acquisition system, high-performance wheel studs, and custom aluminum wheel spacers. The Sienna SE+ Concept awaits its turn to head out on the Autobahn’s south course to run in the exhibition stock touring class. 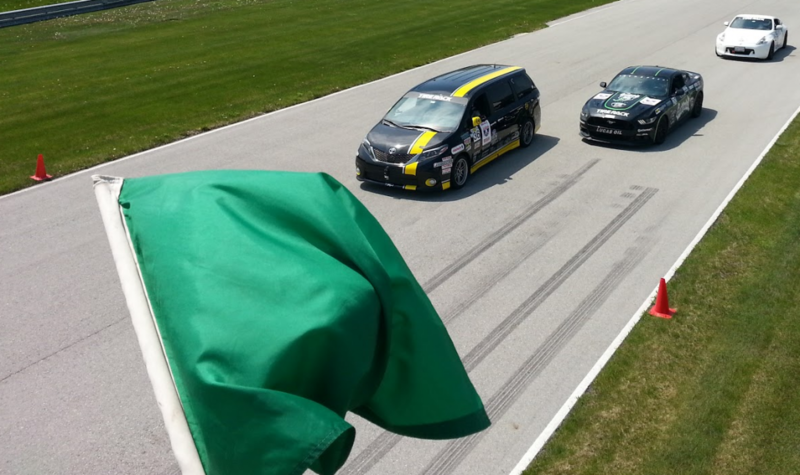 Toyota Sienna Chief Engineer Andy Lund drove the SE+ for the majority of the One Lap event, gaining valuable engineering data and experience that will assist him in making refinements to future production Siennas. Written by: Damon Bell on June 7, 2016.on January 23, 2018. NEW YORK AUTO SHOW: Deploy the Ramp!